Striker James Collins insists his side will head to Newport County this afternoon full of confidence after their morale-boosting 2-2 draw at Coventry City on Tuesday night. With 45 minutes gone at the Ricoh Arena, it had looked like Luton were staring down the barrel of back-to-back league defeats for the first time this season, with the away supporters letting their side know what they thought of the performance. I thought we were the side who was looking to win the game and we go to Saturday full of confidence. 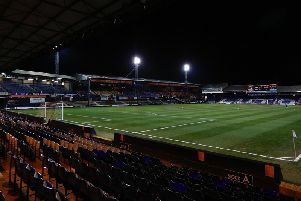 However Scott Cuthbert and then Collins himself were on target to ensure Luton left with a share of the spoils and claimed another crucial point in their quest for promotion. Collins said: “It was game of two halves certainly, the first half they came out of the blocks really fast and we couldn’t really deal with it. ever going to win it in the second half, but a draw was the fair result in the end. “Our formation, we wanted to go for it, we were playing an attacking side, but you’ve just got to give credit to the opposition, they started better than us and we couldn’t get out of our half. Although the Hatters have been on top of the table for almost four months and despite dropping to second, still have a healthy gap to fourth placed Wycombe, Collins could understand the supporters frustrations at the break. He continued: “They’re a passionate group, it’s a massive club and trust me, it’s as disappointing for us as it is when we played like that as it is to them. Collins also felt that the performance on what was a difficult playing surface at the Sky Blues should set them up well for whatever they run out on in Wales today, adding: “It will be similar to tonight, the pitch isn’t great out there, not the best, but second half we showed what we’re all about.